Brought to you by Matterhorn Chalets. Not surprisingly, Zermatt is most loved by the Swiss who flock there in large numbers in both winter (113k) and summer (116k). Who ranks next depends on the season. Zermatt is a true year-round resort. In 2016, 42% of the 487k annual visitors came from May to October, the six months including summer. Many mountain resorts are relatively quiet outside winter. For example, 35% of visitors to Verbier, another Swiss resort, came during the warmer half of the year. Over summer it’s the Japanese who lead. In 2016, close to one in six foreign visitors to Zermatt were from Japan (27,000 or 16%). The two nations have such high mutual-mountain admiration, Zermatt has been twinned with the Japanese Alpine resort Myoko Kogen since 1997. The next nations in Zermatt’s summer-visitor ranking are the US (26k), Germany (21k), China (12k) and Taiwan (12k). When the snow falls the picture changes. The number of visitors from Japan slumps to 2k. In winter it’s the British who reign supreme (14k), after Swiss visitors of course (113k). Next are Germans (13k), Americans (10k), French (5k) and Thais (4k). Surprisingly few visit from neighbouring Italy (2k in winter and 2k in summer), although many of their visits wouldn’t be recorded. 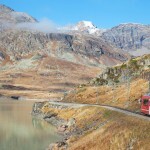 The two resorts of Breuil-Cervinia (Italy) and Zermatt (Switzerland) are connected by ski lifts, but there’s no passport control when you zip over the border to ski or grab lunch. Another all-year-round aspect of Zermatt is its 365-day-a-year skiing. In summer skiing is possible on the glacier or by hiking up beyond the lifts. 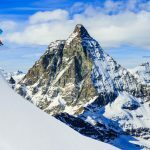 Edward Mannix, manager of Matterhorn Chalets, hiked up to the top of the 4,164m high Breithorn peak at the height of summer to ski a 1,200m powder run – see photo below. Ed is a Brit who came to Zermatt and couldn’t leave. He now lives there all year round with his family. It’s hard to blame him.